A contemporary of Freud and Jung, Dr. Wilhelm Blight was famous for his unorthodox approach to treatment. Blight was a rising star on the frontiers of psychiatry in 1921, when he mysteriously disappeared amid a swirl of rumors involving the occult, and the disappearance of several of his patients. Blight is a powerful sorcerer, who uses his psychiatric techniques to weaken his victims' psychic defenses, and his magic to drain their life force. Consuming this life force is believed to be what has kept him from physically aging since his disappearance at 63 years old. In addition to sustaining his life, the life force seems to boost his magic abilities. Despite his age and small frame, Blight is a tough, fit man who's kept himself in shape. He has no above-average fighting abilities, but he's clever and wily, and he carries a sword cane that he won't hesitate to use when subtler methods fail. Blight is involved in an ongoing struggle with mysterious supernatural forces that exist beneath our reality. The life force he consumes is his weapon in this fight. He is defending the current order of reality against forces that aim to remake it entirely, so he has little regard for the individual lives of a few humans when the whole of reality is at stake. ** How do you use him? 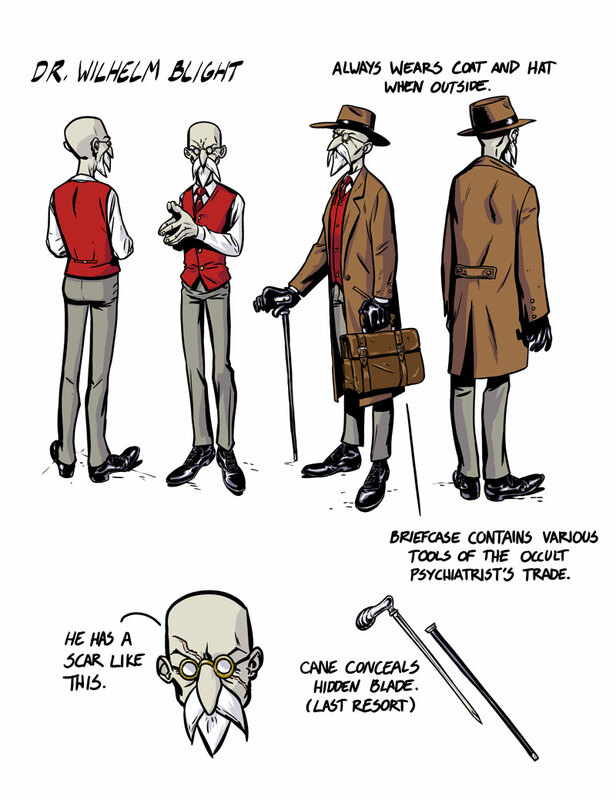 He's basically your standard cartoon German psychiatrist stereotype, with some Lovecraft-flavored sorcery thrown in. When doing his thing on a victim, he speaks cliche psychobabble in an absurd German accent. His magic should be based, as much as is practical, on Psychotherapy techniques and props, e.g. Inkblots, hypnosis, word-association, etc.